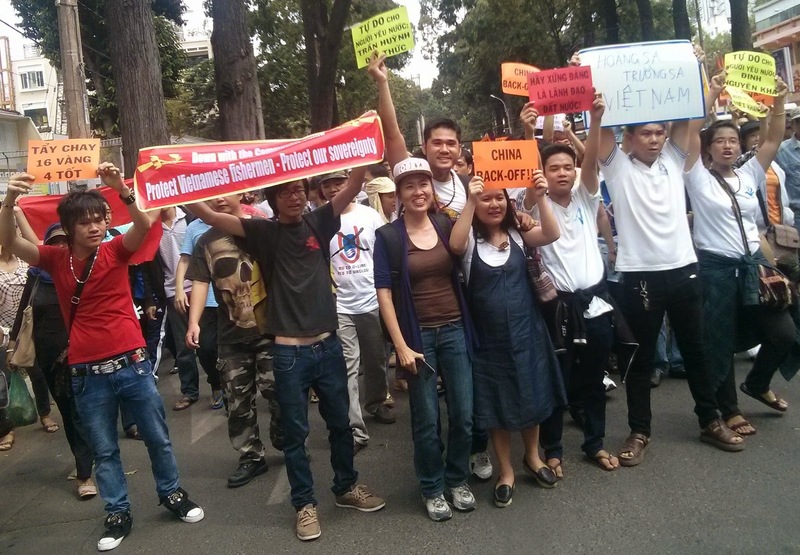 This is a video of the anti-China protest in Saigon last Sunday, May 11, 2014. It may seem like old news at this point, as this week bore witness to some truly groundbreaking developments across the country. The movement is only gaining steam, and within hours from now, further protests are set to take place inside Vietnam. I still feel inclined to post this video though, because certain parts of it are just too great not to share. What makes this video so share-worthy? This, right here. That red flag is Vietnam’s communist flag. According to news circulating around the web, some communist party jerks were instructed to attend the protest and insert that flag into the crowd in an attempt to simulate public support for the VCP (Vietnamese Communist Party). This young lady, clearly offended by this idiotic ploy, took it upon herself to rip down the flag and show the communists what the real deal was. Good luck to everyone out there in Vietnam. We’re all with you. Give ’em hell. There is a storm brewing in Vietnam right now, people. China has been steadily escalating its encroachment on Vietnamese territory, and at this point in time, it seems that the Vietnamese people have finally had enough. This past Sunday, spontaneous demonstrations broke out in Saigon, Hanoi, Danang, and Vinh, spreading like wildfire and growing into full-on political protests with a total of over 3,000 attendees across the four cities. China has recently transported its large oil rig into Vietnam’s EEZ (Exclusive Economic Zone), sparking outrage among the Vietnamese populations, both domestically and abroad. Last week, moreover, the Chinese navy is condemned internationally for harassing Vietnamese boats, spraying personnel with heavy duty water hoses, and injuring 8 people. These incidents are fairly recent, taking place within the last 14 days. Indeed, the events fit perfectly with China’s long pattern of aggressive and illegal behavior on the world stage. The list of belligerent actions that the PRC commits against its neighbors in the Pacific is fairly hefty, and worse, shows no sign of diminishing. China’s heinous actions against Vietnam include state-sponsored piracy against Vietnamese fishermen in the Southeast Asia Sea, unsubstantiated claims to vast amounts of territory in the Pacific, increased military presence in the Paracel and Spratly Islands, and an overall aggressive tone towards its weaker neighbors. The list is by no means limited to these well documented events, as the PRC is understood to also have disputes with Japan and the Philippines over similar issues regarding sovereignty and security. For the longest time, with heavy suppression from the Communist government in Hanoi, the people of Vietnam have been prevented from protesting China’s belligerency. Though demonstrations and gatherings are still planned and orchestrated at various times, they are always crushed by government forces, with heavy penalties for those involved. Lately however, with this past Sunday being a prime example, it seems that the government is no longer able to prevent the people of Vietnam from defending their own country. Just today, in the industrial area in Binh Duong province, one protest exploded to a scale unprecedented in Vietnam’s recent memory, with over 10,000 people in attendance. The momentum seems to be growing, as further protests are planned for this Sunday throughout Vietnam. It’s still too soon to tell what will happen, but from the looks of things, the situation is beginning to really heat up in the Communist-controlled state. I’ll do my best to keep you all updated on the situation. It’s going to be an interesting summer in Vietnam this year.